Convert your iPhone to a handheld biosensor with this cradle and app developed by University of Illinois at Urbana-Champaign researchers. Utilizing its integrated camera as a spectrometer, we demonstrate the use of a smartphone as the detection instrument for a label-free photonic crystal biosensor. A custom-designed cradle holds the smartphone in fixed alignment with optical components, allowing for accurate and repeatable measurements of shifts in the resonant wavelength of the sensor. Externally provided broadband light incident upon an entrance pinhole is subsequently collimated and linearly polarized before passing through the biosensor, which resonantly reflects only a narrow band of wavelengths. A diffraction grating spreads the remaining wavelengths over the camera's pixels to display a high resolution transmission spectrum. The photonic crystal biosensor is fabricated on a plastic substrate and attached to a standard glass microscope slide that can easily be removed and replaced within the optical path. A custom software app was developed to convert the camera images into the photonic crystal transmission spectrum in the visible wavelength range, including curve-fitting analysis that computes the photonic crystal resonant wavelength with 0.009 nm accuracy. We demonstrate the functionality of the system through detection of an immobilized protein monolayer, and selective detection of concentration-dependent antibody binding to a functionalized photonic crystal. We envision the capability for an inexpensive, handheld biosensor instrument with web connectivity to enable point-of-care sensing in environments that have not been practical previously. Science fiction fans have been teased with the idea of a powerful handheld biosensor for quite a while. 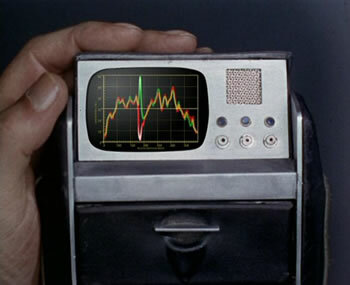 In the 1960's, fans of Star Trek (TOS) recall the handheld tricorders used by both Mr. Spock and Dr. McCoy. More specifically, though, I recall the boink biosensor from Richard Preston's 1997 novel The Cobra Event and the WAGD germ detector from Greg Bear's excellent 2007 novel Quantico. From Label-free biodetection using a smartphone via KurzweilAI.